Presumably not wanting to be outdone by Facebook and its Frank Gehry–designed digs or Apple and its Norman Foster–designed doughnut, Google has tapped two architectural big hitters for its new Mountain View, California headquarters. 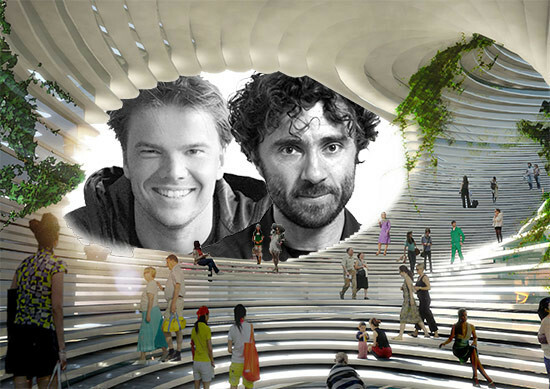 According to the New York Times, the company is expected to announce that the Bjarke Ingels Group (BIG) and Heatherwick Studio are behind the yet-to-be-seen design, which given the two firms' portfolios, should be pretty dramatic. But all we know at this point is that the headquarters will be comprised of "a series of canopylike buildings." No matter what the building—or buildings—looks like, it will likely get some pushback from the community which feels that Google is overextending its footprint in Mountain View. "When Google moved here in 1999," wrote the Times, "it had a dozen employees and a search engine known only to computer aficionados. Now, its 20,000 local employees make it the biggest employer in a city that is bursting at the seams." Two of the most pressing issues that Google and the city will have to hash out moving forward are housing and traffic. The new exhibition Provocations: The Architecture and Design of Heatherwick Studio opened Friday at Los Angeles' Hammer Museum. The show, curated by Brooke Hodge, explores the firm's creative process and the remarkable scope of its work, with a particular focus on public scale projects. AN West Editor Sam Lubell talked with Thomas Heatherwick about the exhibition, his outsider approach, and where he's heading now. Sam Lubell: There doesn't seem to be a category for your work. You're a designer and you're an inventor. 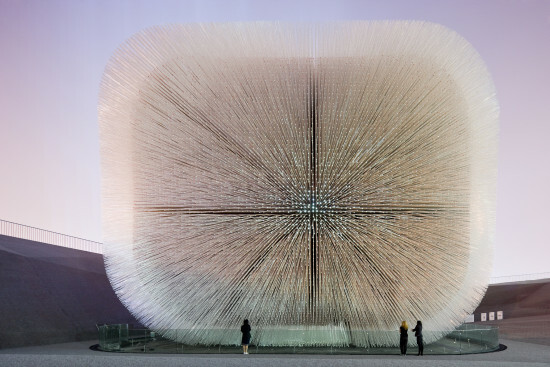 Thomas Heatherwick: It surprised me, when I was growing up the word inventor was always connected to the word mad—mad inventor. And you couldn't study it. But the paintings we valued had an inventive move, the pieces of writing would have an inventive something in them. Sculpture, science, transportation. We're all curious about what the future will be, and the future is made from ideas. But you couldn't study that. The world of developing, evolving ideas was chopped up into these different things with titles. So I was quite surprised. I've always been motivated by where can you make a difference. In a way I'm a problem solver, that's what interests me. The thing is trying to find which problem, and your analysis of what a problem is and where it is. It's all problem solving. It's trying to work out the order to solve those in. You've called your firm "experts in not being experts." To me that's so fascinating. To not be stuck in the expected ideas of what you should be doing. It seems very challenging to maintain that. Especially when you get to be more of an expert in something. Luckily the world is big. Life is relatively short. Projects take so long to actually do that I don't feel worried about it. My studio's been going for twenty years, but you're seeing photographs of our first completed building project in Singapore. (The UK Pavilion is technically a big bungalow.) I think within everything, why waste your time copying yourself or others? There's an attempt to try to hunt down what the solution is. To me with each project, I feel like not that we're generating a solution, but that we're trying to find it. Which means it helps it to be broader than just myself. It really is we're together trying to solve a crime somehow. Often we'll do development work knowing it's not right. But you're needing to eliminate from your enquiries a strand of your ideas to see if they'll teach you something that might work. You've moved from smaller work to buildings and bridges. What's the next frontier? I feel I've barely scraped any frontier. This is going to sound very dull, but my grandmother at the end of her life was in a nursing home. We found the best nursing home we could for her, but it was a really poor environment. But the most alarming part of it was for the staff. We are all going to be that person one day who's there. I want to know society thanks them. I know I'll be old and rotting. It felt to me there's something really wrong in that. You feel you could make a real difference with relatively little resource. Another example is the prison system. Do you really want to hurt someone more and then they come out and sit next to you on the bus? Most people in British prisons have not had the benefits in their life that you and I have had. The notion of a prison as a learning place and not a hurting people more place is exciting. If there's a way to politically enable that to happen when the public wants to condemn. If you hurt them more it's not going to help you. You seem to have this spirit that anything's possible. People are resigned to these areas that you've mentioned. For you it's like no, it doesn't have to be that way. People are cynical, and you guys have this idealism that is really refreshing. I think I've been lucky that for some of the early projects, there were people who supported them and allowed them to happen. That gives you more encouragement to keep going and to believe the best in people. I've trained around some really hard-bitten architectural characters, and you understand why. Because it's very hard to make a building at all, let alone one with any value or quality. And it's really easy to get downtrodden and bitter. I suppose I've very consciously put that in my brain and tried to protect that, and not fall into that trap. Because it's like an itch that's easy to scratch. And as soon as you start scratching, if you don't believe the best of the people around you, then they will conform to being the worst. I see there's a lot of that idea of protecting and not allowing in the forces of cynicism. We're in an interesting time. Particularly in America there's a culture of entrepreneurial optimism and societal improvement in entrepreneurship. So I don't feel alone, I feel particularly inspired by the extraordinary examples of people pursuing an idea and believing something can happen, and there's no reason something shouldn't. Not blaming the world for ideas not happening. Since you're willing to rethink these processes, sometimes people get rubbed the wrong way. There's been some backlash about your attempt to move up in scale. People saying "he's not an architect." How do you respond to that? The studio has 120 architects, and it's a brilliant training. I'm very lucky to work with people who've trained in that way. There's always some friction in change. It would be very weird if there wasn't. The public area between all the private zones is the bit we all share. As we all know, some people are good at adapting to change and others are very fearful of it. You can't predict and control how people feel about things. But I'm very lucky to have this team, and I'm very lucky to have the support that I do. Any innovation I see happening is when people step outside their bubbles. And it seems like that's what you're willing to do. I've never been in a bubble. Maybe I've deliberately protected that. But I've also tried to bring in people who have that expertise to work with us. These designs are very provocative and complex, but they're very human. They're always grounded and approachable and understandable somehow. It's a very real interest. I'm very influenced by the Jane Jacobs book The Death and Life of Great American Cities. It almost made me fall in love with public-ness. With the bit we share together, and the subtle chemistry existing in the social interactions in public space. And William White, who analyzed public space so well in the 70s. Lessons that haven't been learned since. It's just re-tuning in to thinking that's already there, but trying to synthesize and bring that to bear on projects now. Do you think you have more interest now in the public realm than in doing projects for individuals? I've always had that. In a sense you can make more difference. We already know peoples' private homes can be sensational and gorgeous and impressive and that things in art galleries can be stunning and wonderful and in fact you're positively disappointed if they're not. Whereas we have very low expectations of public space. People really don't expect much at all. Having scaled up, are there any major lessons you've learned from working with architects? I built my first building when I was 21 at university, so this isn't new territory. But it takes years to be trusted by cities and property developers and cultural institutions. To be an architect is an impossibly big job. A really good architect is a collaborator, and harnesses the brainpower and brilliance of others. And I feel a strong sense that my role is to try to harness the brilliance of others, and to synthesize and bring that together into projects that have some meaning. I don't see myself so much as an author, I see myself as a "bringer-togetherer" of things. It's deep in me, the passion for both the space and the materiality. And I'm lucky to work with such good people. http://youtu.be/tZTRTv56k58 We have given Apple flack for the suburban nature of its new campus in Cupertino. But we’ve been impressed with the company’s recent attempts to make things more eco-friendly, adding shuttles, bike lanes, a bus transit center, and walking paths. Now we hear Apple is purchasing 130 megawatts worth of energy a year from First Solar. The purchase will power the new HQ as well as all of its other California offices, a large data center, and the 52 retail stores in the state. New York City is losing the 1931 Aluminaire House and its relocating to Palm Spring, California. 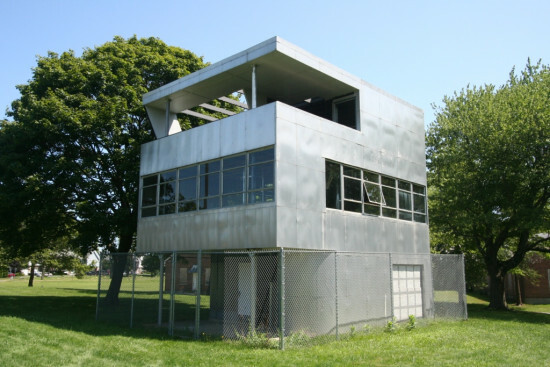 The aluminum alloy and steel structure was created by the architect Albert Frey and A. Lawrence Kocher, managing editor of Architecture Record, and was commissioned by the Architecture League for the Allied Arts and Industry exhibition. In many ways the metal structure is pure New York, a temporary installation first built in the Grand Central Palace on Lexington Avenue between 46th and 47th streets (replaced in 1967 by a 47-floor skyscraper called 245 Park Avenue). The house has been unloved by the city since it was taken down. It stood for some years at the Islip campus of the New York Institute of Technology and a proposal to site in Sunnyside Gardens, Queens was sadly rejected by local residents and since that time has been stored in boxes. Aluminaire Foundation officials think it will need about $600,000 to bring it to Palm Springs and have it erected on a local site. A first effort at fundraising netted $150,00 and now, this weekend, as part of the city's Modernism Week, a second event will be staged at the Frey- (and Robson C. Chambers) designed Tramway Gas Station to raise funds for the foundation. Regardless of New York's apparent lack of desire to keep the structure, it makes some sense to bring it to the dry desert; the city loves modern architecture and Frey lived in the desert city for most of his life. 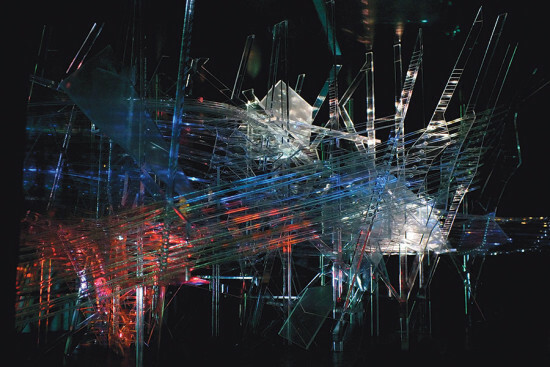 New York, say goodbye to the Aluminaire! Architects may not get much respect in most American cities, but in Palm Spring, California they're stars! 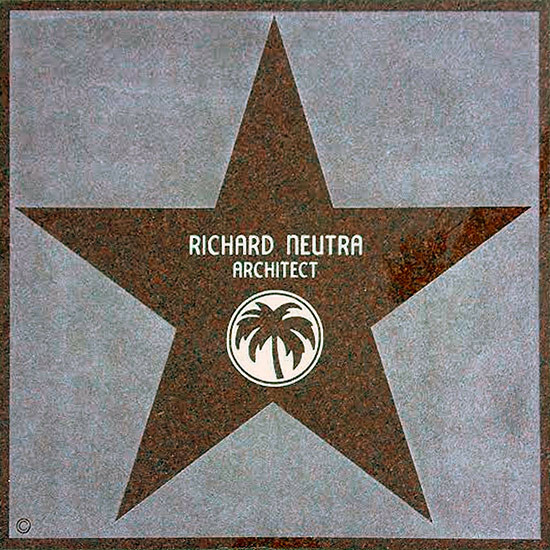 Today Richard Neutra who designed the city's famous Miller House in 1937 and, ten years later, the Kaufmann House will have a star dedicated in his honor on the sidewalk of Palm Canyon Drive just in front of the Palm Springs Architecture Museum. The Austrian emigre will join other architects on the sidewalk including: Albert Frey, Donald Wexler, E. Stewart Williams (who designed the city's architecture museum), William Krisel, and just next to the star of his friend the photographer Julius Shulman. All of these figures were important contributors to the significant architecture culture of this desert city and here they are not only honored but revered. The Architect's Newspaper will be headed to California next week for Palm Springs Modernism Week. It's the sixth year we have served as a media sponsor and we always look forward to the week on the desert as not simply time out from the New York winter but a chance to visit the classic modern houses in the Mojave oasis. In addition, we always make a point to awl through the Palm Springs Modernism Show & Sale where they sell the most incredible modern furniture and objects. There are always a few things affordable even for an architecture editor, but if not it's so much fun to look and fantasize about how these design objects would look in a New York loft. This is the 15th year of the show and sale, and this must make it the longest running modern event like it in the country. This year it will feature 85 of the most prestigious dealers from across the United States and Europe. 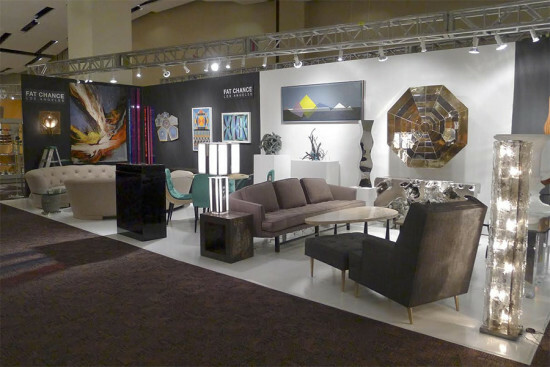 The show and sale takes place at Palm Springs Convention Center and runs from February 13th to the 16th, 2015. While it appears that Los Angeles' famed Norms restaurant is safe, at least for the moment, another local dining landmark is in trouble: Hof's Hut, in Long Beach, which recently suffered "significant damage" due to multiple fires, according to the LA Times. 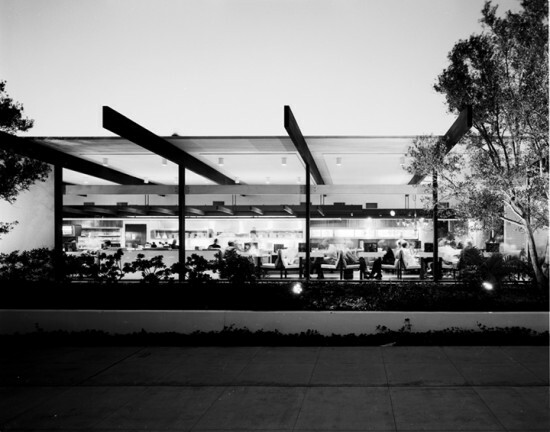 Designed by mid-century architect Edward Killingsworth, the restaurant's exposed post and beam structure and massive windows (now partially hidden by ugly awnings) helped make it a classic for more than half a century. Inspectors are still attempting to determine the cause of the back-to-back fires. To this point the restaurant has not released plans on rebuilding, but in a statement said, “We are devastated by the fire and loss of our Long Beach Blvd. restaurant." There are three other Hof's Huts remaining in Southern California. 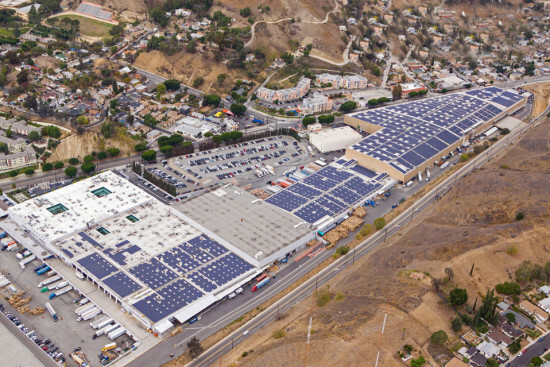 On January 21 solar supplier PermaCity and retailer Forever 21 turned on the switch to their 5.1 MegaWatt DC SunPower solar system in Los Angeles' Lincoln Heights neighborhood. The renovation of the former Macy’s distribution center—now Forever 21's headquarters— was designed by Forever 21 staff with Culver City architect Brian Reiff. The project consists of 15,512 SunPower modules placed on the building's roof, using PermaCity’s SolarStrap—an aluminum and stainless steel, light-weight panel system using no ballast or penetrations. The building is now the largest solar rooftop system in Los Angeles County and the third-largest in California. 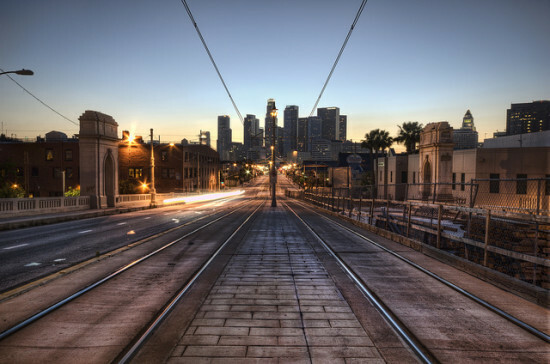 The project was made possible thanks to the Los Angeles Department of Water and Power (LADWP) Feed-in-Tariff, a program launched in 2013 allowing renewable energy plants to sell their power back to the city. The solar panels on the rooftop will generate enough energy to power the equivalent of 1,450 homes, avoiding the production of almost 13 million pounds of carbon dioxide, the equivalent of taking 1,200 passenger cars off the road. Thanks in no small part to the local AEC industry, Los Angeles is a leader in sustainability in several areas, notably green building. But there is still room for improvement, said Matt Petersen, former president and CEO of Global Green USA. Petersen would know: he's the city's first Chief Sustainability Officer, appointed by Mayor Eric Garcetti as part of a broader administrative overhaul. "The mandate the mayor gave me was to build on the great things Los Angeles is already doing, and to put forward a vision for sustainability in the city," explained Petersen. Petersen, who will represent the city at Facades+ LA in early February, has spent the last year preparing Los Angeles' first ever comprehensive sustainability plan. "We're headed toward the finish line as we speak," said Petersen, who expects to deliver the plan to the mayor's office within the next several weeks. "It's been an extensive process of engagement both internally and externally." Water conservation is one of Petersen's top concerns, especially in light of the ongoing drought. In an executive directive released last year, Mayor Garcetti set the ambitious goal of reducing water usage by 20 percent. "The biggest source of water use is outdoor landscaping," noted Petersen. "How do we get Angelenos to replace ornamental lawns with drought-tolerant landscaping?" Architects and landscape architects can play a critical role in encouraging the shift, he said. 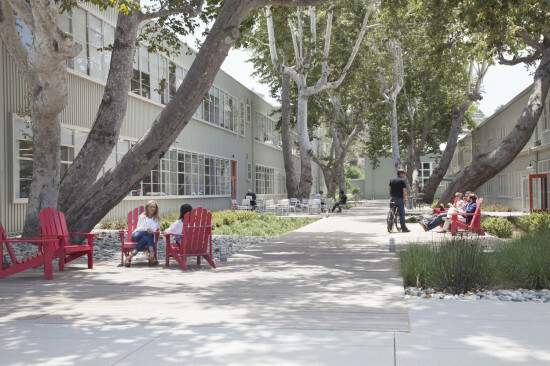 "Landscape architects have a rich history [of working with drought-tolerant landscaping] in Los Angeles—they've done a lot already." As for non-residential projects, said Petersen, "we're really thinking about how to reuse water or divert it before it goes into a storm drain. How do we start to break from the tradition of moving water as quickly as possible from the building site?" Energy efficiency is another area in which Petersen's priorities overlap with AEC industry goals. 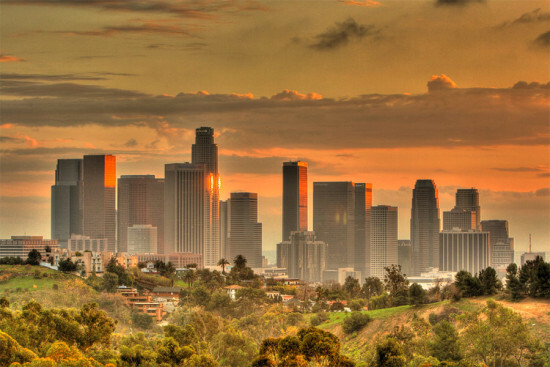 "Los Angeles was a little behind for about a decade, because the utility was historically not investing in energy efficiency," admitted Petersen. His office has set a goal that the utility meets 15 percent of its needs through efficiency measures—the highest such standard in the country. On the positive side, Los Angeles already boasts both more Energy Star buildings and more installed solar than any other city. "Can we build on our leadership and expand the number of LEED-certified buildings, not just to have plaques on the wall, but to encourage an integrated design process?" asked Petersen. "An integrated design process, when done right, can deliver so many benefits. We hope that the design and construction community helps us [get there]." To hear more from Petersen, join the movers and shakers of high performance building envelope design and construction at Facades+ LA. For more information and to register, visit the conference website. Forget about San Francisco being the hardest place to rent in California. According to a story in the New York Times (citing zillow.com), Angelenos spend 47 percent of their income on the median rent. That’s the highest in the country, and significantly higher than San Francisco, which ranks sixth on the list at 40.7 percent. And the problem appears ready to get worse as new supply struggles to keep up with demand in the overcrowded city. Maybe we’ll all have to move to Bakersfield.